Dazzling new parents is easy with the Princess arrangement. The pastel tones of pink and ivory white coalesce to form the ideal gift to celebrate the birth of a beautiful baby girl. 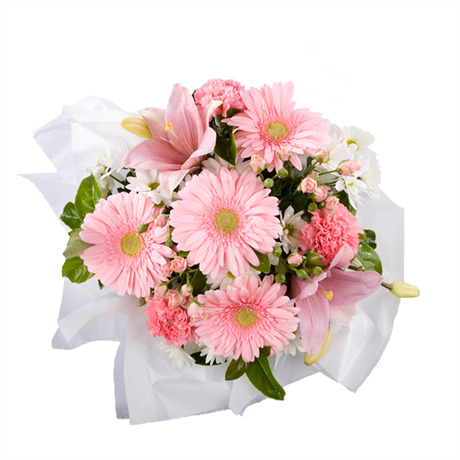 This hospital friendly package features fluffy white chrysanthemums, blush Asiatic lilies, satin pink gerberas, adorable spray roses and frilly carnations. These field fresh flowers are artfully arranged in a gift box embellished with ribbon, making a convenient and low maintenance gift perfect for exhausted new parents. Tiny fingers will love grasping the plush teddy bear that accompanies these sensational flowers.